A recent blog post Technical Interviews Make Me Cry by Pamela Fox tells the personal tale of a technologist and conference speaker who gets a Skype/Stypi interview for her dream job, becomes stumped on a technical question, breaks down in tears, almost abandons the interview, fights through it, and eventually gets the job. Everyone loves a happy ending, and it was courageous for the author to tell her story so publicly as a service to others. However, I think some of her takeaways and the advice she provides can be improved upon. So how can we prevent crying or freezing up during a technical interview? Generally speaking, when you walk into an interview you are at the mercy of the interviewers. Although you may be given some general information regarding the interview format and probably have an idea about the questions or exercises you may encounter, there are endless possibilities on the topics you may be asked about over a two or three hour session. As was stated before, any item on your résumé is fair game, so one way to potentially avoid queries on unfamiliar topics is to keep those words off your résumé. Regardless of what is or isn’t on your résumé, it is quite likely that you will be asked questions pertaining to subjects that are not within your areas of expertise. Trying to fully eliminate the exposure of certain vulnerabilities is an exercise in futility, but there is one rather effective method to at least attempt to mitigate the risks. There is an increasing trend in the technical hiring world for employers to request firm evidence of a candidate’s abilities that go beyond what a traditional résumé includes. For programmers, this typically can be achieved through a code sample. Front-end designers and developers may be expected to show off some UI or website that they built, and architects may be asked to share documents. Mobile developers may hear this more than any other group, and are routinely asked “Do you have any apps available?” as part of the vetting process. One way to partially control the content and direction of your interview is to provide interviewers a work sample that will presumably become a point of discussion. This will turn what could be a technical interrogation into a version of show and tell. Even if the exchange about your sample only takes fifteen minutes, that is fifteen minutes of the interview where you hopefully will shine, and it is fifteen minutes less time for the interviewers to delve into other topics that are probably less familiar. To employ this tactic, be sure to make it known at some point early in the process that you have samples of your work for review by request. A GitHub link at the top of your résumé, a URL to download your mobile app, or a link to sites that you developed are much more graceful than large file attachments. You can choose to extend an invitation to view these projects as early as your résumé submission, and when scheduling the interview you can express your willingness to discuss the projects in more detail and offer to bring a laptop with samples. Independently volunteering to show representations of what you have produced will give an employer the impression that you are both willing and able to demonstrate the quality of your work. That act makes the applicant appear more open and trustworthy than someone who hesitates when asked for some samples. Recruiters and hiring managers alike will welcome résumé submissions that are accompanied by additional supporting evidence of a candidate’s abilities. When you enter the interview, you can mention that you brought samples to show if the team is interested in seeing your work. This will typically be received quite positively and could lead to a deep dive into familiar territory. This post is an excerpt from the recently released ebook Job Tips For GEEKS: The Job Search, available to purchase from Amazon. A sample from the iBook in PDF format can be found here. Today’s software professional is under constant pressure to maintain a high skill level with an ever-changing palette of languages and tools, and the fear of potentially becoming somewhat irrelevant can be daunting. Those that do not keep up with industry trends and movements are at some risk of losing marketability, but even those that do closely follow tech news need to make choices on which skills to pursue (time permitting), which to ignore, and what methods to use in the pursuit. The first instinct to learn something new would naturally be to find some good resources online and perhaps acquire a couple books. You can find presentation slides and videos, articles and blog posts, and even attend live meetups or conferences in addition to your reading. Over the years I have seen hundreds of engineers (accomplished and junior) that invest an extraordinary amount of time to reading about different languages and tools, many of which they may never even get to use professionally. Some even read with the goal of some certification, which they feel will demonstrate mastery of a new skill. I have also come to know another group of technologists who are inclined to learning in a different manner. This group starts off with some amount of reading as well, which might be limited to the product documentation and a quick tutorial, and then immediately transition into a more hands-on approach. Once they have a basic understanding of a language or tool, they actually try to build something. It appears that many technologists are very comfortable with the reading portion of learning, but focus there too long and never get around to creating something. This seems to be common for some college graduates, who obtain a wealth of classroom experience but very little time spent doing. Even if what you build is entirely useless to the world, your creation has value. Learning by doing is not a new concept, so the educational value is obvious. What other value is there? I was prompted to write this post about book learning when I was reviewing my recruiting placements for the past year. The developers I’ve helped into new jobs over the past year have (with few exceptions) had one thing in common – a portfolio of products and code. This was rarely the case ten or even five years go, but today it has become the norm. The Android and iOS developers I’ve placed had at least one app available for download. Web developers were able to demonstrate sites with accompanying code samples. Even the programmers who focused on back end had something to show in interviews. The biggest example of the value of ‘learning by doing’ and a portfolio is probably exemplified by the mobile app space. It’s hard to sell yourself as a mobile developer if you don’t have any mobile app to show, and “Do you have an app?” is probably the first question mobile devs will be asked. Software developers in most other areas are usually not subject to or judged on this direct a question. Put simply, mobile developers know that in most cases having an available app makes you more marketable. Programmers who work in more secure environments, such as those who build defense systems or financial software, often find it impossible to produce a work sample when seeking new employment. Without being able to show your past work and with no personal projects, these candidates are much more liable to be subjected to a language interrogation and the game show style of interviews that many job seekers dread. Marketability may be more tied to experience and somewhat arbitrary measurements of skill instead of demonstrable accomplishment for these candidates. Having a portfolio gives an interviewee a distinct advantage, in that the interviewee has at least some control over the topics that will arise. Walk into an interview empty-handed and the possibilities for question topics are endless, and chances are you won’t have endless answers. If a candidate brings a work sample to an interview, it will almost certainly be included in the discussion, and one would hope that the code’s author should fare better on questions regarding that sample than on questions on random topics. Even average developers should see performance improvement in interviews when the topic is their own code. Read enough to get going, then build something. Don’t worry about whether your something is going to change the world. Save what you build, and occasionally look back and improve upon it. Bring what you build to interviews, and practice talking about your creations. There seem to be a rash of “Am I Unemployable?” posts and comments lately on sites that I frequent, and after reading details the answer in my head is usually “Not quite, but sounds like you are getting there“. In other words, someone will hire you for something, but many who assess themselves as unemployable are going to feel both underpaid and undervalued when they finally find work. How does a technology professional go from being consistently and happily employed for a number of years, only to find himself/herself suddenly unemployable? Better yet, what are the key differences between someone who spends months on a job search and someone who can unexpectedly lose a job Friday and start a new one the following Monday? How do certain people get job offers without having to even interview? It isn’t simply about skill, although that is obviously a factor. Even pros that are highly productive and well-regarded in some circles can encounter challenges in today’s hiring environment. It’s about creating relationships and developing your reputation/visibility. In my experience, pros that are always in demand and rarely (if ever) unemployed seem to share certain sets of habits, and while some of the material below is Career 101 there are some that you probably never considered. As a longtime user group leader and recruiter of software engineers for the past 15 years, I see this first hand on a daily basis. Let’s start with the habits that are the least obvious and progress to some that are more widely practiced. Interview – How often do you interview when you are not actively looking for a job? For most the answer is never, and I’d encourage you to take at least a couple interviews a year. Going on the occasional interview can serve two purposes. First, they are a way to make new contacts and keep your name in the minds of potential employers, with the added benefit that these same interviewers may be working at new companies in a year or two. One interview could lead to an ‘in’ with four or five companies down the road. Second, it is the only way to keep interview skills sharp. Interview practice is best done live without a net, and failing the audition for a job you truly wanted is often attributed to rusty interview chops. Even a simple informational interview request (made by you) is an effective and creative way to make first contact with a potential employer. Know when to leave your job – Without question, the group having the toughest time finding work are unemployed with say ten+ years at the same company, and a close second would be employed workers with that same ten year tenure. For anyone about to scream ‘ageism‘ please hold that thought, as older technologists that have made smart moves do not typically have this issue. I would add that older engineers who possess the habits outlined here are the group being hired without interviews. There are always exceptions, but tech pros can stagnate quicker than those in other industries due to the speed of change in technology. The definition of job hopping has morphed over the past fifteen years, and it is now understood that semi-regular movement is expected and accepted. Where other industries may interpret multiple employers as a symptom of disloyalty, in the software world a pattern of positive (moving to something better) job changes is often more indicative of a highly desirable candidate. Conversely, someone who has remained at a company for many years may be viewed by employers as loyal to a fault and potentially unambitious. If this person has solid skills, why has no company picked him/her up yet? Changing jobs before stagnating is critical to overall employability, and how quickly you stagnate will vary based primarily on your employer’s choices, your own ability to recognize that stagnation is happening, and your desire to not let it happen. Make ‘future marketability’ a primary criterion when choosing jobs or projects – Carefully consider how a new position will impact your ability to find work later in your career and use that as one of your key incentives when evaluating opportunities. Details about your roles and responsibilities as well as the company’s technology choices and reputation in the industry are all potential factors. Does the company tend to use proprietary languages and frameworks that will not be useful later in your career? How will this look on my résumé? Many candidates today are choosing jobs or projects based on an opportunity to learn a new skill, and for this they are usually willing to sacrifice some other criteria. Reach out to others in the community (not coworkers) – How many times have you sent an unsolicited email to someone in your field that you don’t know? “Congrats on your new release, product looks great!” or “Saw that you open sourced, look forward to checking it out” as an email or a tweet is an effective way to create a positive impression with a person or organization. Twitter is great as a public acknowledgment tool, and the character limit can actually be advantageous (no babbling). If you stumble on an article about a local company doing something interesting, there is much to be gained by a 140 character pat on the back. This is essentially networking without the investment of time. Lunch with others (again, not coworkers) – You have to eat lunch anyway, so how about inviting someone you don’t know that well to lunch? Perhaps include a few people that share some common technology interest and turn it into a small roundtable discussion. Meeting with other tech pros outside an interview or meetup environment enables everyone to let their guard down, which leads to honest discussions about the experience of working at a company that you may consider in the future. It’s also an opportunity to learn about what technologies and tools are being used by other local shops. Public speaking – This is an effective way to get attention as an authority in a subject matter, even on a local level. Preparing a presentation can be time consuming, but generally a wise investment. Even speaking to a somewhat small group once a year can help build your reputation. Attend a conference or group meeting – This isn’t to be confused with going to every single meeting for every group in your area. Even getting to an event quarterly keeps you on the radar of others. Make an appearance just to show your face and say hi to a few people. Reading and writing about technology – One could debate whether reading or writing has more value, but some combination of the two is likely the best formula. If you don’t know what to read, follow some peers and a few respected pros from your field on Twitter, LinkedIn or Google+, and make a point to read at least a few hours a week. As for writing, even just making comments and discussing articles has some value, with perhaps more value (for job hunting purposes) in places like Stack Overflow or Hacker News where your comments are scored and can be quantified. Creating your own body of written work should improve your understanding of a topic, demonstrate your ability to articulate that topic, and heighten your standing within the community. Build a personal code repo – Many in the industry balk at this due to the time required, but having some code portfolio seems to be on the rise as an expectation hiring firms have for many senior level candidates. If the code you wrote at work is not available for demonstration during interviews, working on a personal project is more critical. At first glance, this list may appear overwhelming, and I’m certain some readers will point to time constraints and the fact that they are working 60 hour weeks already. Some of these recommendations take considerable time, but at least a few require very little commitment. Employ a few of these tactics and hopefully you will never suffer through a prolonged job search again. “I don’t know x, but I do know y” – This answer is appropriate for questions related to specific technology experience. If you are asked if you have used MySQL, you might mention that you have not but you have used another RDBMS. This lessens the impact of a straight ‘no’ answer, implying that any learning curve will be less severe. If you found this post useful, you may find my ebook Job Tips For GEEKS: The Job Search helpful. 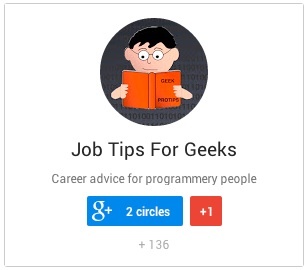 You can also follow Job Tips For Geeks on Facebook, Twitter, or Google+.